Each glacial advance disrupted or reworked older deposits. It is with significant difficulty that Pleistocene history is being reconstructed. Active research by the US Geological Survey is collecting seismic, bathymetric, and well core data for the Coastal Plain, the Continental Shelf, and the Continental Slope and Rise regions offshore in the New York Bight region. (NSF, 1993. Proceedings of the Ocean Drilling Program, v. 150). South of the terminal moraines of the great ice sheet meltwater carried gravel, sand, and rock flour from the melting ice and deposited it on an extensive outwash plain that extended to the coastal areas to the edge of the continental shelf. During the times of the maximum extent of the glaciers, the shoreline may have been as far as seventy miles south and east of the current shoreline. For periods of time when sea level was lower the New York Harbor was probably a canyon for a very turbulent Hudson River (when it wasn't buried by glaciers!). Early in the Pleistocene the gently southward dipping escarpments of Cretaceous and Tertiary strata may have formed ridges as high as 600 feet above (ancient) sea level in parts of Long Island and the Atlantic Highlands of New Jersey. During times when sea level was low, the poorly consolidated sediments deposited during previous cycles of high-standing seas were eroded and reworked. Cores derived from offshore sites display evidence of "over-compaction" caused by dewatering processes when sea level was low (some of which is currently eroding and washing up on area beaches). It was during these times that leaching and soil development occurred in some horizons (which, unfortunately, destoyed most of the fossil shell material). When sea level was high marine waters were able to flood the outwash plain and flood the entrenched stream valleys and low areas carved by glaciers north of the terminal moraine. Where marine water was able to flood low areas estuary environments formed and harbored abundant marine life. Lakes formed on higher ground where drainages were blocked. In parts of central Long Island, fossiliferous estuarine deposits lie on top of the older glacier till and are in turn buried by as much as 40 feet of sand and gravel outwash from the latest Wisconsin Stage glacial advance. On Long Island the fossiliferous estuarine deposits are called the Gardeners Clay. This same fossiliferous unit underlies Sandy Hook. The relationship between the Gardeners Clay unit to other Pleistocene formations in the region isn't clear. Three named Pleistocene Formations are exposed along the Delaware River valley and parts of the coastal plain extending northward from Cape May to Staten Island. The youngest Tertiary gravel is the Beacon Hill (Member?) at the top of the Cohansey Sand Formation. 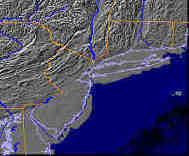 This unit caps the highest hilltops on the Atlantic Highlands and other eroded remnant hills on the coastal plain. Younger Pleistocene units are equivalent to erosional terrace gravels and alluvial facies along ancestral river valleys of the modern Hudson, Raritan, and Delaware rivers in New Jersey. The oldest of these Pleistocene formations is the Bridgetown Formation (probably Sangemon or older in age). The Pensauken Formation is probably equivalent in age to Sangemon Interglacial Stage or younger fluvial erosion and estuarine development. The Cape May Formation represents fluvial and nearshore facies south of the Wisconsin glaciers and Holocene deposits. The relationship between these units with one another and offshore marine deposits is not well defined. Welner, etal., (1993) describes an ancient buried barrier island complex on the modern New Jersey inner shelf and coastal zone. This barrier complex exists 0.2 to 1.7 kilometers offshore and is buried by approximately 20 meters below sediment with an additional 20 meters of water above. They suggest that this ancient barrier is associated with a still stands in sea level, associated with an "middle Wisconsin interstade" (approximately 50-55 thousand years ago) which was preceded by a much higher sea level during the period 70 to 55 thousand years ago. Prior to the ice ages most rivers in the midcontinent region drained northward into the Hudson Bay region. The advancement of glaciers southward blocked, ponded, and diverted river drainages. This process significantly increased the drainages of the modern rivers, and during times of rapid melting water flows must have been very great. Mounting evidence suggest that "breakouts" caused by ponded rivers breaking through ice and morainal dams must have caused massive floods that could have episodically annihilated ecosystems along the mouths of rivers (such as the Hudson). 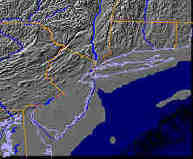 Schuberth, (1968) suggested that prior to the Pleistonene Epoch the ancient Hudson River flowed southward across the coastal plain via the Newark Basin west of the Palisades, snaking through water gaps in the Watchung Mountains in New Jersey before turning eastward south of Staten Island and across the Raritan Bay region before turning southward again near Sandy Hook. 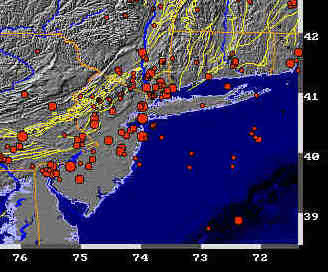 North of NYC the Hudson followed a path fault zones through the Highlands region. 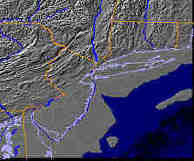 Further north the wide Hudson River lowland east of the Catskills is a testament of a broad flood plain for an ancestral Hudson river in that region. However, the glaciers of the Quaternary changed everything! The evidence for a terminal moraine across the Verrazano Narrows region of the New York Harbor suggests that the river drainage was completely blocked (or even non-existent for a time under the ice) during the climax of the Wisconsin glacier. Water draining from the ice sheet during melting periods carved, or modified, the valleys of Arthur Kill, the Raritan, and Passaic rivers. River channels were block by ice, diverting the drainages southward in advance of the ice sheets. For a time water from the Hudson was diverted across central New Jersey and flowed into the Delaware River in the vicinity of Trenton. For another period it flowed southward around Staten Island in the valley of Arthur Kill while the Verrazano Narrows was blocked. A buried channel of an ancestral Hudson River flowed southward approximately 80 kilometers on the exposed continental shelf. This buried channel ranges in width between 2 and 17 kilometers and was carved into a subaerially exposed surface prior to 28,000 years ago. This channel is buried by as much as 10 to 30 meters of sediments deposited by the late Wisconsin-Holocene transgression. During each of the glacial advances the Hudson River (and its tributaries) deeply cut into its flood plain carving canyons that extended to the edge of the continental shelf, and beyond where submarine erosion processes carved canyons downward to the deep water sedimentary fans on the abyssal plain. During high-standing seas the valleys were flooded, allowing estuary and shelf delta sediments to fill in the submerged valleys. For a time the Wisconsin glacier blocked the drainage of the Passaic River causing a great lake to form, Glacial Lake Passaic, which flooded a low region in the northern Newark Basin region extending southward from possibly as far north as southern New York, westward to the Ramapo mountain front, southward and eastward to the Watchung Mountains, and eastward to the Palisades. The southern margin of the lake was the terminal moraine near Morristown, NJ. The lake was anywhere between 150 to 200 feet deep with a maximum of about 240 feet. (The Great Swamp National Wildlife Refuge - our nation's first - in Morris and Somerset Counties, NJ is a very small remnant of this great lake). Other lakes formed throughout the region caused by stream blockages. 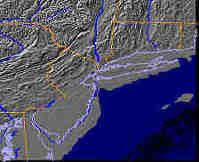 Lakes also formed in the Hudson and Hackensak river valleys. Each of these lakes preserve classic varve-style lake sediments. The name, Flandrian, has been applied to the current sea level rise affecting the coastal regions around the globe which began approximately 18-19,000 years ago (during latest Pleistocene time and continuing progressively during Holocene time to the present). This rise in sea level is directly related to the melting of continental polar and mountain piedmont glaciers. The history of this sea level rise is difficult to decipher for a variety of reasons. Finding ancient sea levels must include consideration of regional and local subsidence, sediment compaction, tectonic movement, and isostatic adjustment due to variation in load by ice, water, and sediment. With all of these factors considered, practically no two beaches have the same geologic history (Bloom, 1993). Climatic changes throughout this time period have caused regional and global variability in the rates of melting. For instance, a study of Seneca Lake sediments suggested that an ice-free, yet cold climate persisted in the New York Region until as recently as 10,000 to 8,000 years ago (Anderson & Mullins, 1997, Geology 25(2), p.135-138). However, during the "Hypisthermal" (or Altisthermal), a time period within the early Holocene global temperatures may have been as much as 4 degrees higher (around 8 to 7,000 years ago). During that time Africa was much wetter and the midwestern US was a desert. Global temperatures have fallen since then (so much for "global warming...?"). Sea level during the Flandrian transgression may have advanced and fallen haltingly, with an overall trend toward rising to its current level. During the "climax" of the Wisconsin glacial advance (about 18,000 years ago) sea level was anywhere between 70 to 150 meters below its current level (depending on whose interpreation you choose. Most researchers agree that the lowest sea level corresponds to the the location of the "break in slope" at the outer edge of the continental shelf (which isn't as easy to find as you might expect!). For example, Nordstrom, et al., (1986) suggests that sea level has risen about 150 meter (400-450 feet) in the last 19,000 years. Dillon and Oldale, (1978) suggests that crustal downwarping by glacier loading of the Atlantic coastal plain created a "Wisconsin forebulge" and isostatic adjustment after the glaciers melted. They suggested that the lowering of sea level never exceed 100 meters during the past 25,000 years. The figures below illustrate the geometry of changes in sea level in the New York Bight region at 10 meter intervals starting at -50 meters - the approximate position of sea level at the end of the Pleistocene. However, these even numbered intervals of sea level rise do not reflect the rate at which sea level has changed through time. Sea level probably rose quite rapidly at the end of the Pleistocene, possibly catastropically in some coastal areas as great meltwater lakes in ice-blocked river drainages burst through their natural ice dams. The rate of sea level rise slowed drastically about 4000 years ago when sea level was about five meters below its current level. It has been in the last 4000 years that the majority of modern coastal barrier islands and tidal wetlands have developed. Sea level changes on 10 meter intervals [AGI Portrait USA]. The images presented above were generated from modern water depth data. The "real" ancient shorelines were probably somewhat different because river channels, moraine deposits, and offshore bars have changed dramatically through time. With lower sea level the Hudson, Raritan, Hackensack, Passaic, Navesink, and Shrewsbury rivers all contributed vast quantities of sediment to the New York Bight, especially during the heavy melting periods near the end of the Pleistocene. With lower sea level, the three rivers merged and created one large storm and tidal dominated delta complex somewhat beyond the current Outer Harbor region. Once in the ocean marine and tidal currents, and longshore drift spread the sediment along the coast and across the continental shelf and beyond. Although most of the old Pleistocene Hudson River valley is mostly filled with filled with modern sediments, the passage on the continental shelf is still evident on bathymetric charts. After leaving the central Outer Harbor area it bends southeastward and continues in that general direction until it descends into deep water as the Hudson Canyon at the continental shelf margin. Humans likely migrated into the region as the glaciers retreated and inhabited the landscape at the same time when both fauna and flora advanced their ranges northward into the ice-free areas. (The romantic notion that "old growth forests" existed before Europeans arrived on the continent isn't completely true; modern ecosystems evolved along with an endemic human population.) The timing of the first migration of humans into North America is still under debate. But, the timing of the first population explosion of "Native Americans" was probably concurrent with the mass extinction of the majority of large land mammal at the beginning of the current Holocene Epoch approximately 10,000 years before present. The abundance of Folsom- and Clovis-style projectile points scattered throughout North America dating from earliest Holocene time support this claim. If these paleo-Indian cultures bear any similarity to modern human cultural fantasies about living near the ocean then, unfortunately, much of their archeological record is lost. Sea level is continuing to rise slowly contributing the difficulty of our modern civilization's need and desire to occupy the coastal environment. As much as rising sea level is a problem for Long Island and New Jersey shore residents, our problems are nothing compared to the occupants of the lowlands in South Florida and in other heavily populated coastal areas in subtropical regions. (South Florida will no longer exist after a two meter rise in sea level, especially with the destructive assistance of inevitable class 4-5 hurricanes like Andrew (1992) or Camille (1969) - or even worse!). Unfortunately, it is inevitable that coastal residents in our region will not truly understand the significance of a giant storm until one comes to visit. Both the last Pleistocene glacial advance and the following recent transgression of the sea contributed most to the evolution of the modern landscape in the New York Bight region. Many geologic processes are occurring around us. First, the melting of the glacial ice is allowing the land in the region to "rebound" after the removal of the ice overburden. The extent or significance of this process is not clearly understood, yet some possible features in the region may be related to this effect. 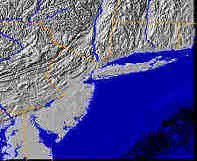 For instance, the high coastal elevations of both Staten Island and the Atlantic Highlands region near Sandy Hook may, in part, be due to glacial rebound. If this is true, then perhaps a global rise in sea level may be less significant for New York's future. On the other hand, a dangerous consequence of glacial rebound it that it could serve as "trigger mechanism" for potentially catastrophic earthquakes in the region. New York has experienced several +5 Richter magnitude earthquakes in historic times, including a ~5.5 magnitude quake centered in the vicinity of Gravesend Bay in Brooklyn (still not enough to do extensive damage). Both Boston and Charleston, South Carolina are East Coast experienced devastating earthquakes and fires in there history. I believe it is fair to say that New York City and surrounding population centers are utterly unprepared for any significant natural disaster. (Someday, maybe... for fun, why not as the mayor about NYC's disaster evacution plan -- (there is none! ).